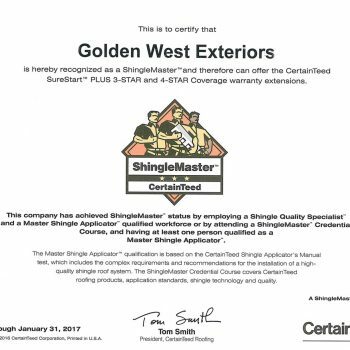 Golden West Exteriors has achieved ShingleMaster status from CertainTeed, allowing it to offer the SureStart PLUS 3-STAR and 4-STAR Coverage roof warranty extensions. 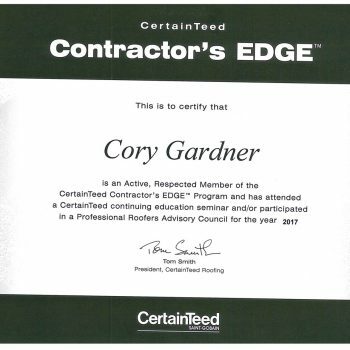 Certainteed ShingleMaster status is achieved by employing a Master Shingle Applicator qualified workforce (including one roofing job supervisor and at least two roofing installers). When you hire a roofing contractor, you are giving them a very important task—the task of installing a product that will protect your home and your family for decades to come. It stands to reason that you would want to work with a company that has a history and track record of providing high quality service when you are ready to hire. 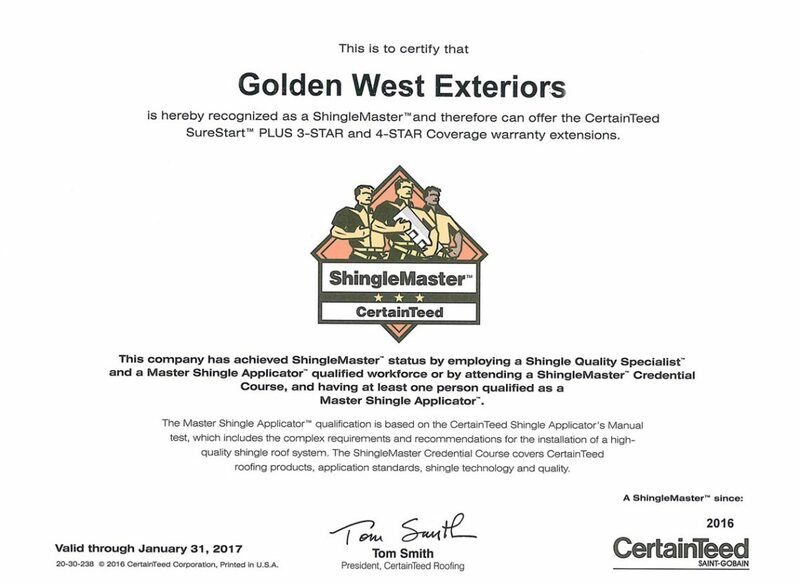 For many homeowners, that means seeking out a CertainTeed Select ShingleMaster™ contractor for roof replacement, like Golden West Exteriors. Here are just a few of the benefits of seeking out this type of contractor. Any good, local, roofer in Edmonton AB will tell you, the most common reason that a roof will fail is not because of poor quality materials, but because of improper installation. Whether the homeowner tried to install a roof themselves or they hired a poor quality contractor to do the job, the result is the same: a roof that fails long before it should, and added expense for the homeowner. 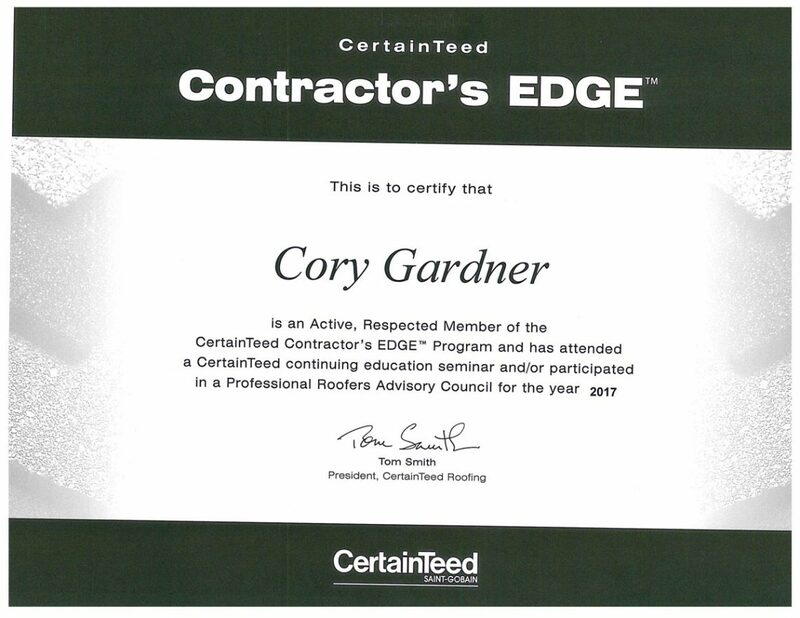 By working with a CertainTeed Select Shingle Master™ you can be assured that he or she has the proper skills and education to install every roof to the highest standards. Roof installation is about more than just putting shingles on a roof, and in order to get the longest-lasting installation, your roofer should also be well versed in things like flashing and ventilation, plus gutter repair and gutter protection in Edmonton AB, and the local area. All of these play an important role in the overall health and well being of your roof. Hiring a CertainTeed Select Shingle Master™ also means that homeowners have the benefit of better warranty coverage. Since these contractors are trained and certified by shingle manufacturer CertainTeed, the company trusts their workmanship and will be able to provide you as a homeowner with SureStart™ PLUS extended warranty coverage, and you can rest assured that your installation will be in compliance with all warranty standards so there are no surprises if you every need to redeem the warranty—that’s something only a Select Shingle MasterTM can say. Before you hire just any contractor to install new roofing in Edmonton, make sure you find the ones that are most qualified, ensuring exceptional quality and great customer service like Golden West Exteriors.